Having a well erected fence can add interest and charm to any garden along with providing privacy from your neighbours, protection from the elements and adding overall security to your property. 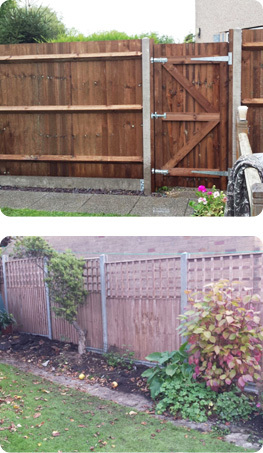 Good fencing can complete the overall look of your garden. We also supply and install shed bases. Our team take pride in carrying out all of the fencing and gardening work ourselves, without having to rely on outside labour. Your old fencing will be discarded of and all garden rubbish will be cleared before we start work on building you a beautiful new fence. Here at A&E Garden Construction, we only use high quality materials and we ensure that the fencing is pressure treated timber. Concrete or timber posts can be used to construct your new fence, our friendly team will discuss the different options with you and what would be most suitable for your garden. There are almost as many choice of walling as there are patios and driveways. For every style of property you could think of, we have a beautiful wall design to complement it along with pathways, steps and decorative edges. Let us make your garden look unique by taking advantage of our expertise and knowledge in the industry. Call our experts to discuss what you want from your garden, how you want the space to work and we will help and advise you on the best materials on the market and the best design to complete the overall look of your garden. Our experienced team here at A&E Garden Construction can add a beautiful wooden gate to your garden. Whether you are looking for a set of gates for the front of your house or driveway or you are looking for a side gate to your garden, our experts can deliver. We offer a number of wooden gate designs using only the best materials at competitive prices. Ask a member of our team for more information and book your free home visit to discuss your requirements on 01895 675941. Landscape services: Fencing, garden landscaping, driveways, patios, turfing, garden walls. Fencing suppliers and erectors, feather edge fencing, trellis fencing, lattice fencing, security fencing, Fencing Ruislip, fencing Harrow, landscaping Ruislip, landscaping Harrow, garden landscaping Ruislip, driveways Ruislip, driveways Harrow, paving company Ruislip, paving company Harrow.